Barter Books : Mitchell, Fred [ed.] 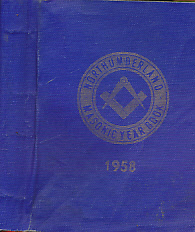 : The Masonic Year Book for the Province of Northumberland. 1958. 120 x 90 mm (5 x 4 inches) - 372pp. Softback cloth covered paper cover. G: in Good condition without dust jacket as issued. Cover rubbed and damsptained.